If you’re looking to start or expand a business, a small business loan can help. Here’s everything you need to know before you apply. Business loans don't just help businesses get to the next level. John Paul DeJoria is a first-generation American who had a tough start in life. He was sent to live in a foster home in Los Angeles at age 10. He grew up, got involved in LA gangs, and eventually joined the military. When he returned from service, he worked briefly at a lab where haircare products were made. In 1980, he quit the lab and took out a $700 loan to start a shampoo business, called John Paul Mitchell Systems. He lived out of his car while selling shampoo door to door. A $700 business loan in 1980 would be equal to about a $2,500 loan in 2018. Today, John Paul Mitchell Systems rakes in annual revenues of around $1 billion dollars. A loan can make your business dream a reality. Follow these steps and you'll be on your way to getting approved for your own life-changing business loan. You probably have a good idea why your company needs to borrow funds. There are three general categories for needing a business loan. It's good to know what category your borrowing needs fall into. Specific terms for your loan (for example, whether it's long-term or short-term) depend on your situation. You've got your idea. The business plan is in your hand. A budget spreadsheet has been calculated. The biggest challenge is going to be accessing the money you need to make your plan a reality. Starting a company from scratch always requires funds. Buying equipment, renting or purchasing a property, getting inventory or materials, and paying staff are all significant start-up costs. Banks are notoriously reluctant to fund start-ups. Start-up companies usually have no revenue, no financial statements, and lack a proven track record. These companies are often considered too big of a risk for most banks when it comes to conventional business loans. Don't be discouraged. Fortunately, there are other loan options for financing business start-ups other than traditional bank business loans. Business loans are often used to expand an existing business. Whether it's purchasing new equipment, adding to the existing space, or hiring new employees, growing a business requires funding. Borrowing to grow is easier than starting up. Since existing businesses typically have financial statements, revenue, and business equity, it should be easier to find a business loan. Not as scary to lenders. 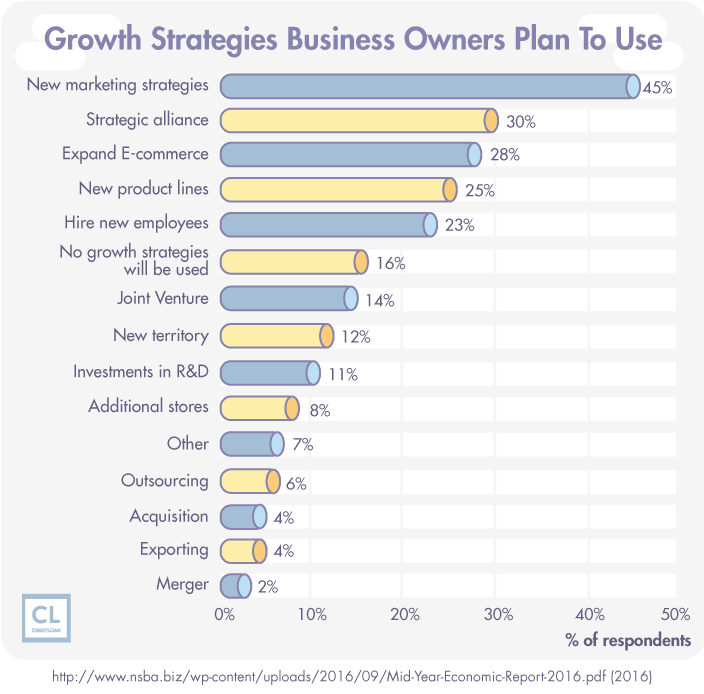 Growing an already-proven business is much less of a risk than starting a brand new one. Business owners in this scenario should carefully consider multiple loan offers since they probably qualify for very good terms. The third reason a business owner might find themselves needing a loan is for day-to-day business costs. Ups and downs are expected. For many businesses, revenue doesn't come in as a steady stream. There are times when expenses are higher, like when a company must ramp up production to meet a big upcoming order. Other times, income might be lacking, for example, a temporary decline in sales before the introduction of a new product. Cash flow issues shouldn't cripple a company. There are loans available that can bridge the gap and help the company through its lean months. No business should needlessly suffer simply due to a lack of cash. When it comes to business loans, it's important to know exactly how much you need to borrow to meet your goals. It's understandable why a business owner might feel the need to secure as much capital as possible, at every possible chance. This is not the best idea. It's tempting to max out. Going for the maximum available from a lender you qualify for might seem logical. After all, you might not know if you'll get approved for a loan again. Borrow for the best Return On Investment. The reality is, getting more money isn't always going to produce more Return On Investment (ROI). A business needs to calculate exactly how much it needs to fulfill its plans. Most business owners expect a $5 return on every $1 borrowed. So, if a business strives to generate $250,000 in new income, it should be looking to borrow $50,000. Borrowing $100K to make $250K lowers the ROI. It's smart to make sure your business doesn't take on too much debt. The other side of the problem is when a business doesn't borrow enough. Don't lowball. Trying to keep costs down is a healthy natural reflex for a business owner. However, a business can find itself strapped for the cash it needs to cover a project if it doesn't borrow enough. Plan for problems. If you fail to borrow enough and your budget is extremely tight, unexpected expenses can derail plans. It's wise to add 10–15% to your loan budget for unexpected costs. The next proven strategy for getting a business loan is to learn about the different loans available to businesses so you can choose the right one. The type of loan you choose should match your business' borrowing priorities. A small business line of credit gives you a borrowing account with a cap on the amount of funding you can access. Only pay interest on what you use. The advantage of a business line of credit over a lump sum business loan is you only pay interest on what you've spent. For example, if you have a line of credit with a total of $100,000 available and you only carry a $25,000 unpaid monthly balance, you'll only be charged interest on the $25,000. If you got a $100,000 loan, you'd be paying interest on the full amount from day one. Get credit on your accounts receivable. One specific type of line of credit for businesses lets a company borrow based on how much other companies owe it. As the companies pay back their accounts receivable, the credit line gets paid back. A working capital loan is usually accessed by an existing company to get it through a period of low cash flow. Short-term and relatively small. Working capital loans usually have terms as short as 30 days or as long as one year. The amount small businesses typically get through these loans is $5,000–$100,000. You might need collateral. If a business doesn't have a lot of credit history, it might have to put up some collateral (such as vehicles or property) to guarantee a working capital loan. A small business term loan has a set dollar amount (for example $200,000) and can be used to finance a business' operations, expansion, or capital expenses. Fixed repayment schedule over the loan term. The loan and its interest get paid back in monthly installments over the loan period (usually from six months to three years). Pop a balloon at the end. The principal can get amortized over the life of the loan, or the lender can agree upon a large "balloon payment" to be made towards the end of the term. Remember when I mentioned banks rarely lend to new businesses? In our society, becoming an entrepreneur is often the key to individual success. That's why the banks' reluctance to lend money to start-ups is a huge problem. Enter the Small Business Administration. The U.S. government addresses this problem through its Small Business Administration (SBA). Some banks offer low-interest loans to small businesses when they are backed by a guarantee from the SBA. Great loan terms to support small business success. Interest rates, repayment terms, and fees are usually much better for SBA loans than other business loans. Get ready to jump through hoops. SBA small business loans usually range $50,000–$5,000,000. You should be prepared to go through a lengthy and time-consuming application process to secure the loan. If a small business needs to acquire vehicles, machinery, or technology, an equipment loan could be the best option. Secured by a down payment. Equipment loans are usually secured by a down payment (typically 20% of the purchase price). Flexible terms for repayment. Equipment loans can be anywhere from $5,000 to $500,0000, and the interest rate can be either fixed or variable. Repayment of the principal is usually amortized over a 2–4 year loan period and the interest is paid monthly. Some business owners are reluctant to finance operations with a business credit card. If they knew how to use these credit tools properly, they'd realize how effective business credit cards are for short-term business financing. Get rewarded for business spending. Cash back and reward programs can earn you points to support expenses like business travel. Short-term capital at zero interest. Many business credit cards also give you a 0% APR introductory period that you can capitalize on. If you can pay off an expense within a 6- or 12-month introductory period, you can essentially get a zero-interest loan! Just watch out for potentially high credit card APRs once the intro period is over. So, you've figured out what your own business borrowing needs are and the type of loan best suited to meet those needs. Now it's time to go shopping for your loan. Out of all seven proven strategies we're giving you here for getting a business loan, choosing the right lender is probably the most important. There are several reputable online lending companies providing loans quickly and easily to small businesses. Business financing at the click of a mouse. Loan amounts from online lenders are typically $5,000–$500,000. Cash advances, working capital loans, and short-term loans are available from sites like Swift Capital, Fundera, and Lending Tree. Commercial banks like Wells Fargo, JP Morgan, and Citibank traditionally lend to businesses. Banks take their time. 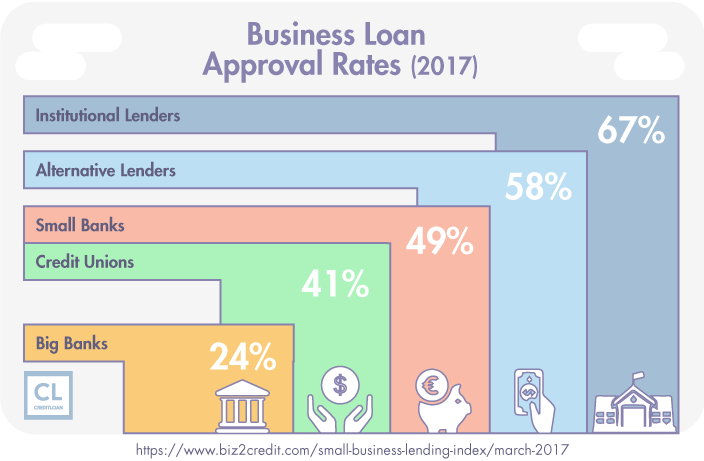 If you're approaching a bank for a business loan, it typically takes a longer length of time to get approval than most other channels. Approvals are more limited. There is usually a very detailed application process for a bank loan. The criteria for lending among these commercial banks are more restrictive than any of the other channels listed here. 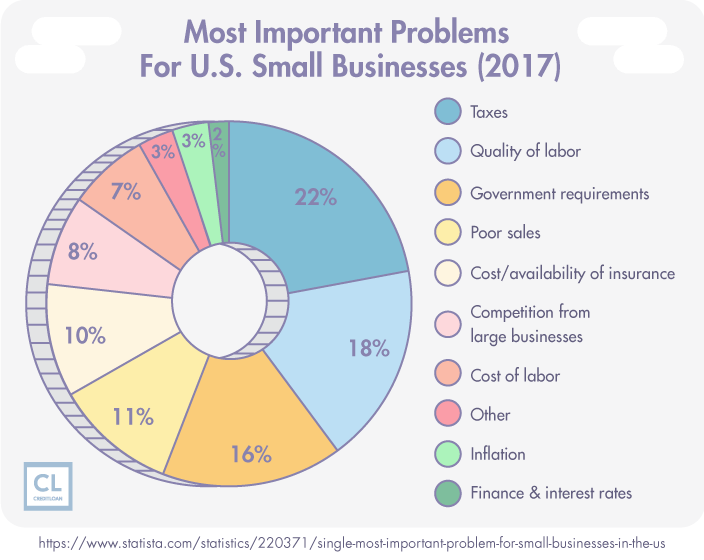 In contrast to the big commercial banks, smaller community banks and credit unions are often eager to finance a local small business. Reach out for financing. Look up the credit unions and community banks serving your area and set up a meeting with a loan advisor. Often the APR offered by a credit union or community bank is lower than what's offered at a large commercial bank. Peer-to-peer lending sites like Prosper or Lending Club connect businesses in need of financing with individual and industry lenders. Higher APRs. The APRs offered by peer-to-peer lenders are usually higher than banks and credit unions. Easier and faster to get approved. As a trade-off for the higher APR, it's easier to get approved for a peer-to-peer loan. It's also much faster than getting a loan from a bank. Some banks like Wells Fargo have partnered with the Small Business Administration to offer business loans to small businesses at favorable rates. Loans guaranteed by the SBA have great terms. Lower down payments and longer repayment terms are offered for small business loans. SBA loans also often back large-scale purchases or construction—which is good news if your business is looking to undergo expansion. When you're out looking for a loan you should be aware of what criteria your business will be judged on. Every business has what's called a "credit and risk profile"
It's important to know how your risk is being assessed. If you're applying for a small business loan, one of the first things potential lenders will check is your personal credit score and credit report. This could make or break your application. So in case you need to boost a less-than-ideal credit score to improve your chances of getting approved, consider getting a smaller personal loan first. Existing loans and cash flow will be considered. If adding another loan to a list of existing loans looks like it will cause a cash flow crisis, the application won't be approved. Business assets are a plus. The lenders you approach will assess the value of your business' existing assets. In the eventuality that you default, your existing assets can be taken to serve as payment. The past influences the present. The history of your business—for example, how long it has been in operation—will be taken into consideration by lenders. Investment attracts more investment. If your business has already secured venture capital investors or angel investors, the lenders will look upon your application more favorably. No matter which lender you approach, you're going to need to bring along a lot of relevant documentation. Your chances of getting approved will get better depending on how much accurate and reliable information you can provide. Start with all your official business documents. The business license with the official name, federal tax ID, articles of incorporation, and other filings or legal documentation will be the first things the lender wants. Financial documents are key. The lender is also going to want to know how your company performs (or expects to perform) financially. Three years' worth of financial statements, projected financial statements, a business credit report, tax returns, bank statements, and personal reports on the finances of the company's owner, could all be submitted. Don't forget your loan request details. Presenting a well-crafted business plan, including a breakdown of where the loan funds will go and how they'll be spent, is absolutely crucial. Evidence of loan collateral also informs lenders of your potential security. We're down to our final tip, and this one's a biggie. Take your glasses out because it's time to read the fine print. Hopefully, you'll manage to get several loan offers. You must carefully consider all of your options to ensure that you are getting the best deal. It's all about the interest. When you're comparing proposals, you'd want to prioritize the option with the lowest APR. Make sure you're also considering if interest is payable weekly or monthly and whether it comes with a fixed or a variable interest rate. Repayment plans matter. The loan repayment schedule, including the number of monthly payments, needs to be affordable based on your cash flow. Add up the fees. Lenders can charge other fees you need to take into consideration. Loan origination fees are charges for finding you the loan. Early pre-payment penalties can be charged if you want to pay your loan off before the agreed-upon term. It can also give the financial boost a company needs to take its business to the next level. By applying the seven strategies we've offered here, you can confidently approach the right lender. Do your research and be aware of all the loan options available and everything you need to do to secure the right loan for your needs. With the right amount of funding from the right lender, you'll be able to realize the plans you have for your business. You could be setting a course towards achieving billion-dollar status in the future. Just remember—it worked for the guy who started John Paul Mitchell Systems. Do you have any advice or tips for getting a small business loan? What's your experience?